Yesterday afternoon saw me crossing London to attend my second NetIKX seminar, which I was looking forward to after a very interesting first foray a few months ago on the topic of social media use in organisations. On this occasion we were to learn about the use of River Diagrams in facilitating knowledge sharing, from ChrisCollison, originally from BP and now working independently via Knowledgeable Ltd.
Chris described knowledge management as a learning marketplace, with supply (of people with knowledge) and demand (of people needing to learn). For any marketplace to work effectively, however, it needs a shared currency (so there is benefit to both sides in making the trade) and a common language (so that what is being traded is clearly understood by both parties). The process of creating River Diagrams, and analysing them using Stairs Diagram (more on these later!) facilitates the creation of this common language as well as highlighting clearly which parties have knowledge and which parties need that knowledge. OK, so what are River Diagrams and how do you go about creating one? Firstly you need a group of participants. These could be representatives from different departments within an organisation, people from several business units within a company, or different stakeholders concerned with the same social, political or business issue. Then you need to decide upon which topic or area of performance you want to benchmark or measure. Chris described a River Diagram exercise from his time at BP, where they wanted to compare their 99 business units to agree which operational areas they all had in common (eg health & safety, corrosion management, water handling, etc), and benchmark performance of all the business units in each area. First of all the participants needed to agree the operational areas and ‘what success looks like’ for each one. This is part of creating that common language. To make the model work, they needed to agree five levels of performance for each operational area, from ‘world class’ (5) down to ‘basic’ (1). With the remaining cells coloured green, the river analogy suddenly becomes clearer! The ‘river banks’ represent those areas where none of the business units had a score. Each group also records which two of the topic areas they would like to improve, and by how much. Adding in this information allows the facilitators and participants to see where groups have knowledge to share (since they scored highly in that area) and where there are groups are keen to learn (since they logged a desire to improve their score in that area). The black line shows the scores for Group A added to the composite diagram, and the two red lines show the two areas they chose in which they’d like to improve. This shows each Group plotted according to the levels they scored (vertically) and the gap between their current level and the score they would like to reach (horizontal). 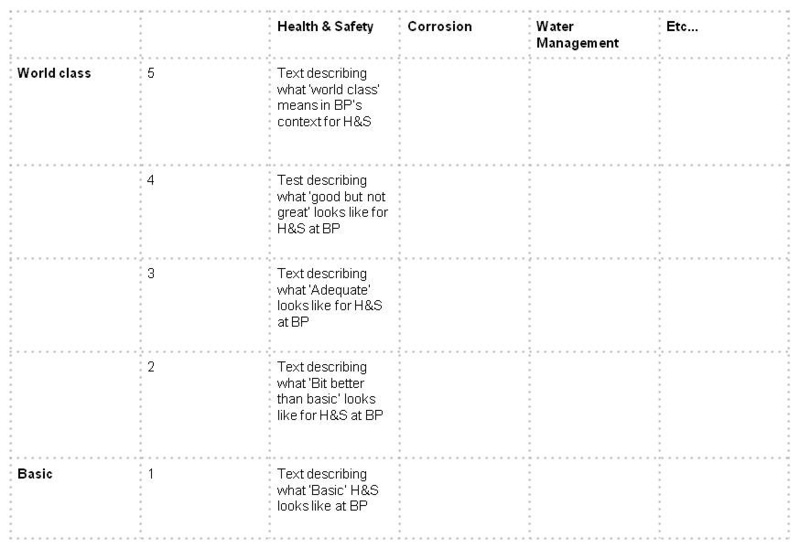 You can see that Group A could benefit from having a dialogue with Group B or E who are both at level 5 for this topic. Chris went on to tell us about using the River Diagram technique to help the UN HIV and Aids group work with stakeholder groups across the world, to find out and benchmark the elements that make up a successful Aids management programme and to help the different groups learn from each other. Chris emphasised that a lot of the work for this technique goes into the selection of topics and discussion to agree on the descriptions of each of the different levels, for each topic. Once he’d explained how it all worked, it was time for us to have a go at creating our own River Diagram. Since there wasn’t time in the afternoon session to write all the level descriptions, Chris had pre-prepared one based on a topic he hoped we were all familiar with – information and knowledge management! He asked us to rate our own organisations for each of the topic areas he’d selected (eg, Knowledge Strategy, Using and Accessing Expertise, Exploiting Information, etc). It became clear that there would be a lot of value in getting different stakeholders in an organisation, department or other group to discuss where they felt their body scored for each area – and why. Another suggestion from the floor was that it would be valuable to re-run an exercise like this in 6 months time, to get a comparison and measure whether any improvements had been made in the targeted areas. The formal part of the afternoon concluded at about 5.00pm, followed by some equally enjoyable wine and networking. I found this a very enjoyable and interesting session, and think this would be a valuable tool to add to any information and knowledge manager’s armoury. This entry was posted in Developing and exploiting information and knowledge and tagged Professionalism, Tools and methodologies. Bookmark the permalink. Within Nicola’s report on our most recent NetIKX meeting, there is a link to the OGC (which is the Office of Government Commerce) website. For information, and according to the website, “the OGC is an independent office of HM Treasury, established to help Government deliver best value from its spending” … but times certainly seem to be changing. Please adapt accordingly; there is some interesting material on the existing OGC website, which, assuming that the above notice is correct, will shortly to be transferred to a location within the National Archives website domain, as noted above. Thankyou for this summary of the meeting. I would have liked to have been there but couldn’t attend, so this has been a very helpful follow-up.